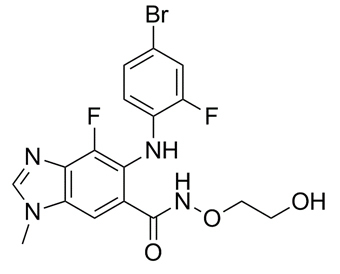 Binimetinib, also known as MEK162 (ARRY-162), is an oral, highly selective MEK inhibitor. In preclinical studies, MEK162 showed significant antitumor activities in cell lines and animal models. MEK162 is the first targeted therapy to show activity in patients with NRAS -mutated melanoma and might offer a new option for a cancer with few effective treatments.
. J Pheneger, et al. 2006, ACR Annual Scientific Meeting. Abst 794.
. Serra V, et al. RSK3/4 mediate resistance to PI3K pathway inhibitors in breast cancer. J Clin Invest, 2013, 123(6), 2551-2563.
. Kiessling MK, et al. Mutant HRAS as novel target for MEK and mTOR inhibitors. Oncotarget. 2015 Dec 8;6(39):42183-96.